Animis Foundation medical assistant, Danielle Ball, gives fluids and oxygen to two rescued eagles found at the Marion County Baseline Landfill on Monday, February 2, 2015. Special Agent John Rawls, FWS-LE (U.S.
Ocala, Florida —The bald eagle—the symbol of our nation—which is protected under the Bald and Golden Eagle Protection Act, faces a new threat in Marion County today. Michelle Whitfield, head of the wildlife department at the Animis Foundation, said bald eagles and other wildlife are being poisoned, but not how one would think. The Animis Foundation alleges that the Marion County Animal Shelter has been recklessly dumping euthanized animals at the Marion County Baseline Landfill, which is located next to the shelter. 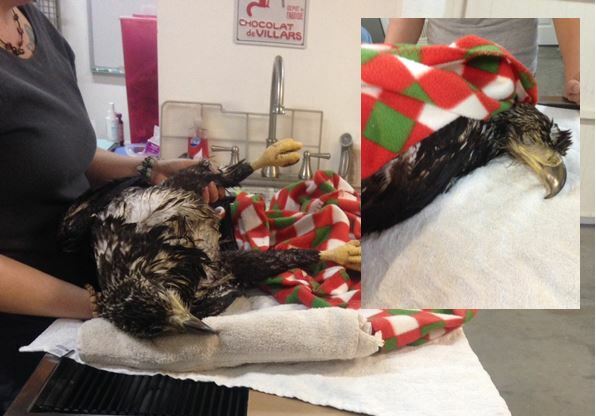 Animis Foundation caring for an eagle that was found two years ago. This eagle tested positive for pentobarbital. Photo provided by the Animis Foundation. Whitfield said two years ago when a bald eagle was found nearly dead at the landfill, Animis and Dr. Shannon Kennedy performed a toxicology screen on the eagle’s blood. She said the results were disturbing. Test results showed the eagle had been poisoned with pentobarbital, a drug commonly used by veterinarians to euthanize animals. Pentobarbital is a barbiturate, which slows the activity of the brain and nervous system. Whitfield said the eagles are eating the dead animals that have been discarded by the shelter; therefore, the pentobarbital is being passed onto the eagles. Now, residents want to know if the animals are being discarded like trash instead of incinerated. Questions about whether or not the drug could seep into the aquifer have also been raised. 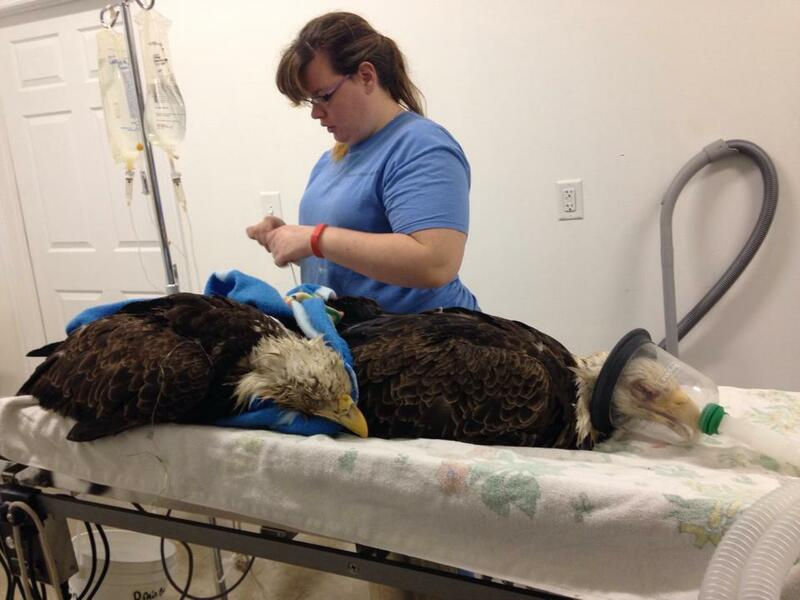 On February 2, 2015, two additional bald eagles were found near death at the Baseline Landfill. The eagles were treated for poisoning. Once stabilized, they would be transported to the Audubon Center for Birds of Prey. 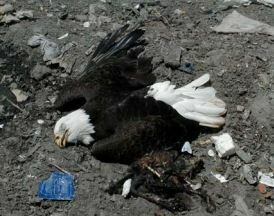 This makes a total of 10 bald eagles in the past two years that have been found at the landfill. The Florida Fish and Wildlife Conservation (FWC), initially, was not involved with this investigation. In fact, the FWC was not even made aware of the situation until February 4, when county officials called the FWC and began to ask questions about Animis. In an attempt to discredit Animis, the county wanted to know if Animis was associated with FWC, which they are not. Animis is its own licensed entity; however, FWC wanted to make it clear that Animis is on FWC’s approved list of wildlife animals rescue rehabilitators. Animis frequently rescues animals for the FWC if an officer with FWC is not available. Rumors began to spread through social media the moment Animis posted the story on Facebook, and people quickly began to confuse FWC and FWS, which are two separate agencies. It should be clear that FWC is not the lead in the investigation and was at no point made aware of the situation until yesterday. Ocala Post reached out to the Marion County Animal Shelter and asked what their procedure was for discarding euthanized animals. As always with Marion County officials, Ocala Post never received a reply. The DEP has not yet responded to Ocala Post’s questions in regards to whether or not there would be an investigation against the Marion County Baseline Landfill. Ocala Post also contacted the EPA; we are waiting on a response. Ocala Post was notified earlier today that one of the bald eagles passed away. The other is still recovering. Ocala Post was also contacted by several former employees of the Marion County Animals Shelter that wish to do an interview. Stay tuned for those details. How does Solid Waste handle deceased animals at the landfill? Step 1: Deceased animals are transported (whether by individual, agency or business) to the landfill’s inbound scale and reported to Solid Waste staff. Scale personnel notify the operators on the landfill. Step 2: Operators excavate a hole at least 3 feet or more in depth, exceeding state statute requirements for a hole to be at least 2 feet in depth. Step 3: The vehicle containing the deceased animal(s) is brought near the excavated hole for depositing. The landfill operator completes the deposit and covers with materials excavated from creating the hole. Step 4: Operators continue to push and pack materials over the surface until end of work day. Step 5: On closing, operators cover all areas on which they worked with a 6-inch dirt cover or a tarp, both methods authorized by the FDEP permit. When a pet owner brings their pet in to be euthanized, the pet owner would have the choice of taking the body of the animal home or allow the animal to be discarded with the trash at the landfill. After this story went viral, Elaine DeIorio McClain, Public Information Officer for the Marion County Office of Public Information, responded to Ocala Post’s information request. However, the response contained information Ocala Post had previously included in the article. Stay tuned to Ocala Post for updates, as Ocala Post is waiting on further correspondence from FWS.